The initial portions of most wedding receptions are among the nicest parts of any Washington, DC area wedding day in our opinion as professional wedding photographers. It is certainly a great time for getting some beautiful photography! From the moment the bride and groom make their grand entrance to the raucous applause of their families, friends and invited wedding guests to the time when the band or DJ throws open the dance floor and invites everyone to celebrate the marriage of two people they care about, the early stages of a reception are chockfull of emotion, meaning lots of opportunities for impactful photos. To some degree, that stage of a wedding day represents the transition between the solemnity of the ceremony and the fun of the rest of the reception, and as a result, it offers some of the most complex emotions of a marriage celebrations. And complexity always makes the pictures that we take more nuanced and interesting! The first dances are obviously a crowd favorite. Wedding guests love to see the bride and groom twirling around the dance floor in what is essentially the first thing they do as a married couple. There are occasional tears of happiness shed by some of the bridesmaids (and even a groomsman or two, in our experience), but the moment is joyful in nature. That first dance really is a celebration of the newlyweds and them starting their new life together. The more emotionally complicated moments come during the parent-child dances, particularly the one between the bride and her father. When the father of the bride sharing one more dance with his little girl is a happy event, of course, but that happiness is tempered by a bit of sadness. There is a hint of melancholy, because having a dance together symbolically represents him letting go of his daughter. That process of saying goodbye begins when he walks her down the aisle to meet her future husband and concludes when they take center stage for their dance. As they move around the floor, he has one last chance to whisper a few of advice or to tell her how much he loves her and how proud of her he is. A chance for him to say his farewells, even if it is not going to be forever. It is not surprising that the moment brings tears to the eyes of many a guest, especially the bridesmaids, who can imagine themselves sharing a beautiful dance with their own dads. 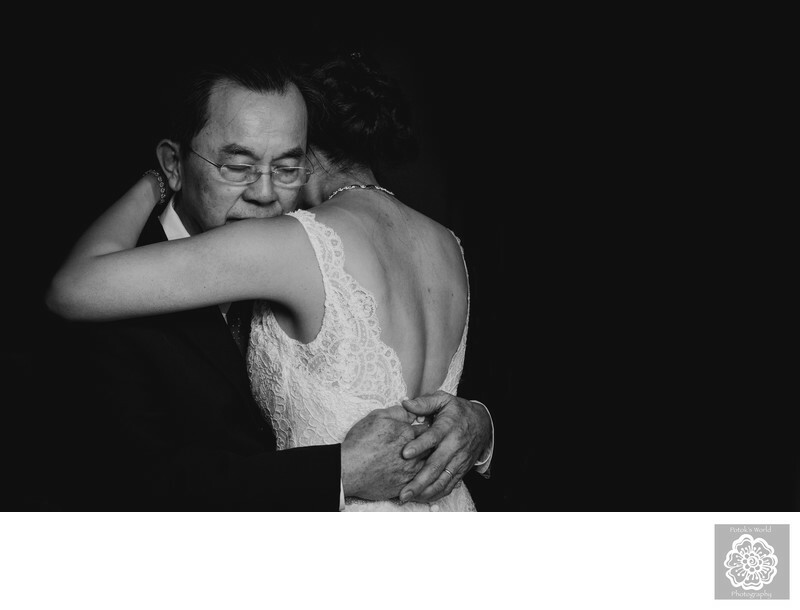 We feel that this particular image, which was taken in the reception area at the swanky and elegant Chantilly National Golf and Country Club in suburban Washington, DC, perfectly captures the emotions that a father of the bride feels when sharing a dance with his daughter. This dad looks happy and sad at the same time, which is the way that most fathers must feel at this moment. As you can see in the image, he was holding the bride tightly throughout the song, as though he never wanted to let her go. But his face says that he knows that he must.